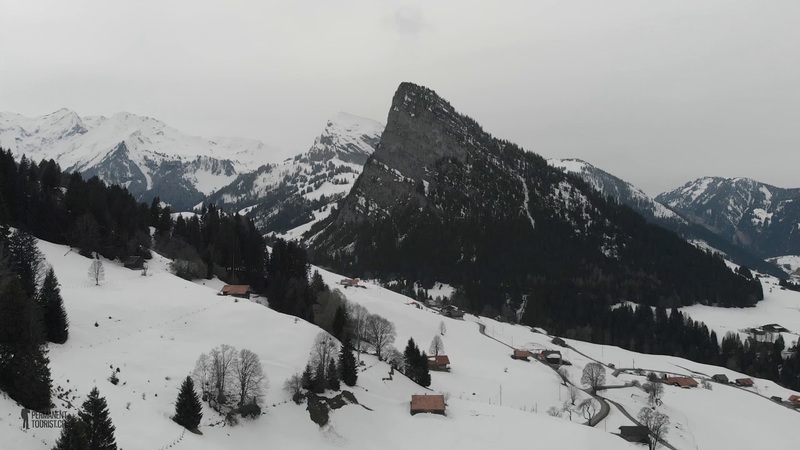 Aerial sequences of the quiet and peaceful Diemtigal Valley in Switzerland. The best time to visit the mountain villages near our home is between the tourist seasons, when many hotels are closed and the valleys, cable cars and mountain cableways are much quieter. We drove up to Grindelwald shortly before Christmas, to visit the mountain restaurant at Schreckfeld, where deep snow and temperatures as low as -12°C greeted us. A testing and rewarding hike from the peat moorland of Lombachalp to two summits on the vertiginous Brienzergrat ridge. Views from home across the lake to the Niederhorn on a winter Sunday. A hair-raising sledge run - our first of this season - in the awe-inspiring Schilttal valley above Mürren. Before the proper snow arrived at the start of this year's winter season, we visited Zermatt and visited the famous, much-photographed view of the Matterhorn from Riffelsee. Bachalp is an area of the mountains which ring the northern side of the Grindelwald valley. It’s a popular tourist destination, as its fairly easy to reach on foot in around 45 minutes from the cable car station at First. Hardier walkers continue on from the much-photographed lake Bachalpsee onto a steeper path, which leads up to the Faulhorn mountain hostel. At the end of a long afternoon’s drive from home, via Kandersteg, Brig, the Simplon Pass and a very narrow and windy road through the Ticinese mountains, we arrived at Locarno, on the shores of Lago Maggiore, just in time to catch the last sun of the winter day. A picturesque hike on the way to the Faulhorn, from Grindelwald First in the Bernese Oberland of Switzerland. Attempting to get away from baking temperatures, we headed for the mountains and a hike across summer snow fields to the Gries glacier. The Melchsee is a lake in the mountains, tucked away in the lee of a range of peaks between Meiringen and Engelberg. Nearby, the smaller stretch of water called Blauseeli (little blue lake) is a haven for frogs after the snows melt, and the edges of the pool are lined with frog spawn at this time of year.